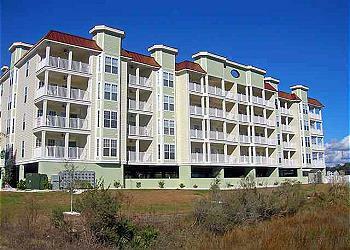 We have a vast selection of North Myrtle Beach vacation rentals that we’re proud of and would be happy to show you. Our group of finer beach homes, villas, and oceanfront condominiums will appeal to your sense of aesthetics and class. We know there are plenty of low-end condominiums out there that come up short and will leave you wanting. Pass them by and step up and into a better style of vacation rental -- take a look at the North Myrtle Beach vacation rentals we have to offer you. At Carolina Resorts Realty and Vacations we wouldn’t put you in any vacation rental we wouldn’t want to stay in ourselves and we can tell you right now, our expectations are very high. So come look at the accommodations we offer and we know you’ll be pleased with our North Myrtle Beach vacation rentals. 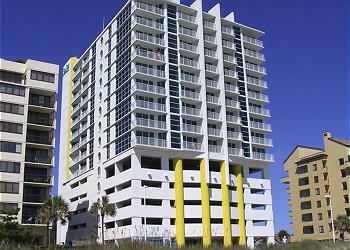 North Myrtle Beach offers many prime vacation opportunities. Families from all over the country come to the area to enjoy everything from a rich South Carolina history to popular entertainment spots. The area boasts an array of exciting venues, restaurants and shopping for everyone's taste. Take the family to the adventurous Medieval Times or enjoy live beach music at Broadway at the Beach. 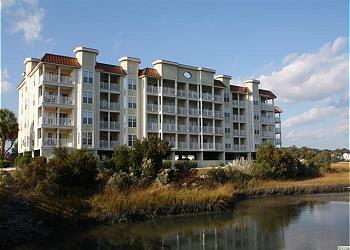 Listed below are North Myrtle Beach Vacation Rentals in the Carolina Resorts Vacations rental program for 2019. If you are interested in more details and availability of one of our North Myrtle Beach Vacation Rentals properties, please click "More Info" listed in each vacation property description. INLET POINTE VILLAS UNIT 1F 2BR OCEANFRONT DIRECTLY ON INLET. Inlet Point Villas is a NON-SMOKING PROPERTY, set in a private, gated resort that is uniquely located on a point which fronts both the Atlantic Ocean as well as Hog Inlet. It lies directly across from Waties Island, an undeveloped barrier island to which you can swim, raft or kayak for shelling and exploration*. The tidal marshes are also fantastic for kayaking and fishing, as well as wildlife viewing. Includes Free WiFi The huge private beach is ever changing with the tides and currents. The many sandbars and tidal pools are excellent places for children to wade and explore. All one sees at Inlet Point is NATURE in all its glory! There are no other buildings or high rises to mar the view. The sunsets and sunrises are awe inspiring! There is truly no location on the entire Grand Strand to compare to Inlet Point in terms of its incredible natural beauty.GREAT ROMANTIC DESTINATION AS WELL AS WONDERFUL PLACE FOR FAMILIES! 3rd Floor walkup. 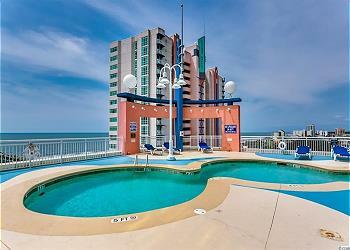 Unit is rated Well Maintained, Comfortable & Appealing *( Be careful of the ocean currents! Small children should not be allowed to cross on thier own.) (This property does not allow boats, trailers nor motorcycles. You may ONLY have parking permits for up to 2 vehicles. Also pets are not allowed nor is the discharge of fireworks from the property, nor is the use of laser pointers.) UNIT DOES NOT ALLOW SMOKING AND IS DESIGNATED A NON-SMOKING UNIT . This unit has a minimum age requirement of 25 years of age and the booking is to a group of individuals then all persons in a group have to be over the age of 25 years. This does not apply to mother and fathers with children albeit in those cases the parents must be over the age of 25. Rental Agreement is required! This unit is a 3rd floor condo and there is no elevator. Ocean Marsh Villas is a marsh front property nested among beautiful live oaks. It is a low rise property with only 36 units... the grounds of the property are pristine, and the amenties surprising for a property this size... Your family will very much enjoy the marsh front environment, with its opportunities for crabbing, fishing for flounder and watching the blue herons and egrets work the water for dinner! The property has a marsh front pool, jacuzzi and kiddee pool as well as picnic tables and barbeque grill right beside the marsh... the property is located 3 short blocks to the beach and it is an easy walk to the beach as well as Barefoot Landing... . This unit comes with a 50 inch TV in the living room and flat screen tvs in both of the bedrooms as well as FREE WiFi internet and DVD player! There is a full size washer and dryer in the condos own laundry room and a fully equipped kitchen with microwave, dishwasher and drip coffee maker as well as all appliances and basic dishes and untensils. The unit was professionally decorated and it is very nice as well as very comfortable... The units are very attractively priced to be this nice and this close to the beach... You would certainly enjoy renting this great unit! Unit rating is Luxury (This property does not allow boats, trailers nor motorcycles. You may ONLY have parking permits for up to 2 vehicles. Also pets are not allowed nor is the discharge of fireworks from the property, nor is the use of laser pointers.) THIS BUILDING & UNIT DOES NOT ALLOW SMOKING AND IS DESIGNATED A NON-SMOKING UNIT . This unit has a minimum age requirement of 25 years of age and the booking is to a group of individuals then all persons in a group have to be over the age of 25 years. This does not apply to mother and fathers with children albeit in those cases the parents must be over the age of 25. Rental Agreement is required! Ocean Marsh Villas is a marsh front property nested among beautiful live oaks. It is a low rise property with only 36 units... the grounds of the property are pristine, and the amenties surprising for a property this size... Your family will very much enjoy the marsh front environment, with its opportunities for crabbing, fishing for flounder and watching the blue herons and egrets work the water for dinner! The property has a marsh front pool, jacuzzi and kiddee pool as well as picnic tables and barbeque grill right beside the marsh... the property is located 3 short blocks to the beach and it is an easy walk to the beachas well as Barefoot Landing ... . This unit comes with a 65 inch flat screen TV in the living room as well as a 65 inch flat screen in the master bedroom as well as another flat screen tvs in the second bedrooms as well as FREE WiFi internet and DVD player and DVR! There is a full size washer and dryer in the condos own laundry room and a fully equipped kitchen with microwave, dishwasher and drip coffee maker as well as all appliances and basic dishes and untensils. The unit was professionally decorated and it is very nice as well as very comfortable... The units are very attractively priced to be this nice and this close to the beach... You would certainly enjoy renting this great unit! Unit rating is Luxury (This property does not allow boats, trailers nor motorcycles. You may ONLY have parking permits for up to 2 vehicles. Also pets are not allowed nor is the discharge of fireworks from the property, nor is the use of laser pointers.) THIS BUILDING & UNIT DOES NOT ALLOW SMOKING AND IS DESIGNATED A NON-SMOKING UNIT. This unit has a minimum age requirement of 25 years of age and the booking is to a group of individuals then all persons in a group have to be over the age of 25 years. This does not apply to mother and fathers with children albeit in those cases the parents must be over the age of 25. Rental Agreement is required! The Oceans 906 is a direct oceanfront condo located on the 9th floor and is located in the Cherry Grove section and is one of the most popular resorts in Cherry Grove! It is located within walking distance to Boulineaus IGA grocery store, miniature golf, arcades and beach ware shops as well as shopping and dining... Enjoy a great Seafood dinner at Duffy Street Seafood Shack, or if you like like that try eating at the Shack that serves 3 meals daily! This unit is a 2 Bedroom Grand, meaning its a larger 2 bedroom. There are 2 TVs in the condo as well as a DVD player and FREE WiFi to go with the 3 queen beds and one twin bed. There are 2 directly oceanfront private balconies in this unit. One is off the living room and the other is off the master bedroom! The property has a large oceanfront pool and jacuzzi, and internet. There is a washer and dryer onsite. It is a great unit. Unit rating Well Maintained, Comfortable & Appealing The Cherry Grove Pier is about 1/2 to the north and Ocean Drive with all of its shops and amusement park is about 2 miles to the south... Cherry Grove is convenient to the Little River waterfront and tons of activities including championship golf at over 100 courses. It is 4 miles to the Grand Strand airport and 16 miles from the main commercial airport (This property does not allow boats, trailers nor motorcycles. You may ONLY have parking permits for up to 2 vehicles. Also pets are not allowed nor is the discharge of fireworks from the property, nor is the use of laser pointers.) THIS BUILDING & UNIT DOES NOT ALLOW SMOKING AND IS DESIGNATED A NON-SMOKING UNIT . This unit has a minimum age requirement of 25 years of age and the booking is to a group of individuals then all persons in a group have to be over the age of 25 years. This does not apply to mother and fathers with children albeit in those cases the parents must be over the age of 25. Rental Agreement is required! Unit is rated a basic and affordable property. Parking underneath the building is limited to vehicles less than 6 foot 5 inches. Taller vehicles will have to park across the street in the parking lot for the Oceans. . . : : Refine Your Search Results : : . .